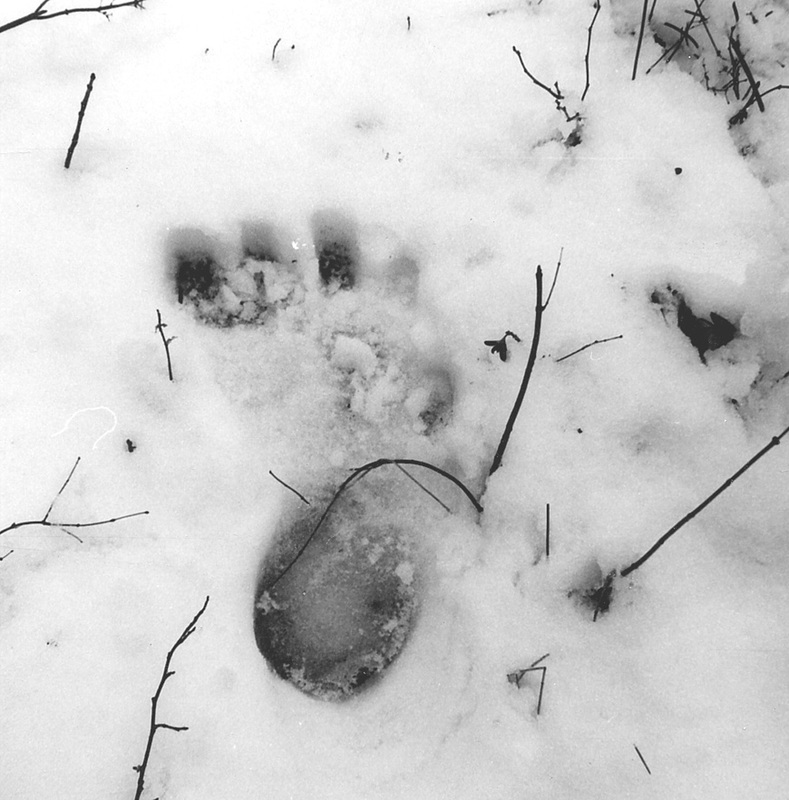 Footprints Gallery - Sasquatch Canada contains current and authoritative information on sasquatch and other homins. 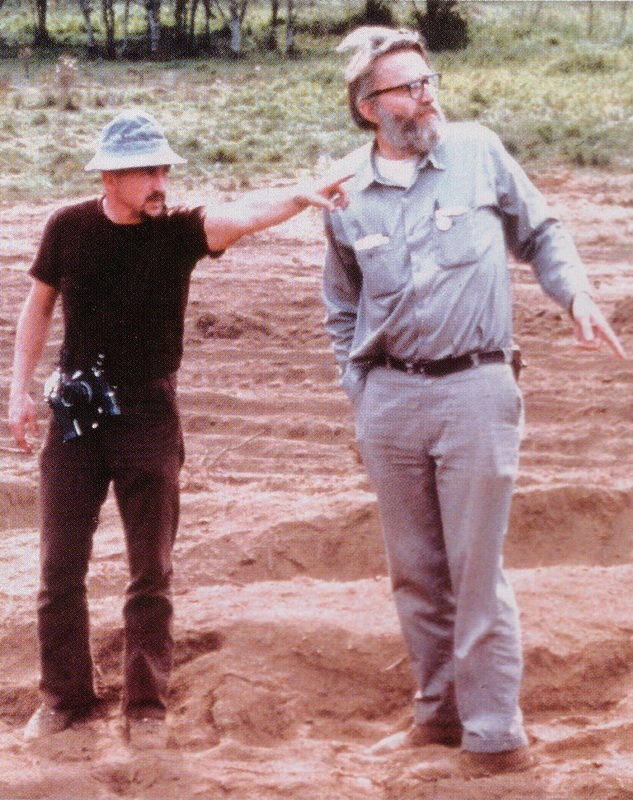 The photographs shown here were taken by John Green and René Dahinden during research they performed in California in 1967. 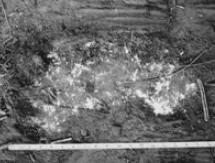 The prints found on Blue Creek Mountain were beside a road that was being constructed. They were in soft earth on the shoulder of the road. estimated that the actual number was probably well over 1,000! A straight walking pattern is evident in this photo. This print measures 15 inches. John Green is seen measuring the creature's toe to heel pace. 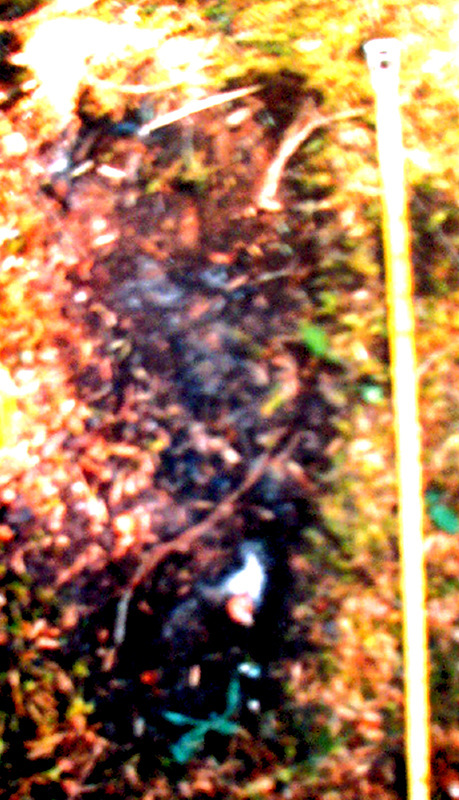 Green is using a yardstick and we can see that the prints are about 1 yard, or 3 feet apart. A 6 foot tall man would have an equal toe to heel pace of 20-22 inches. The prints seen here are of a 15-inch and a 13-inch print crossing each other's path. This print measures 15 inches long, 7 inches across the ball of the foot, and almost 5 inches across the heel. 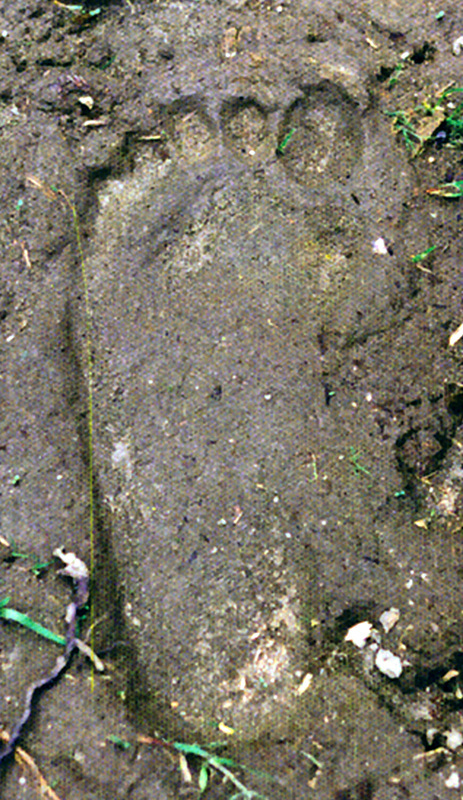 Footprint with a size 12 boot print. 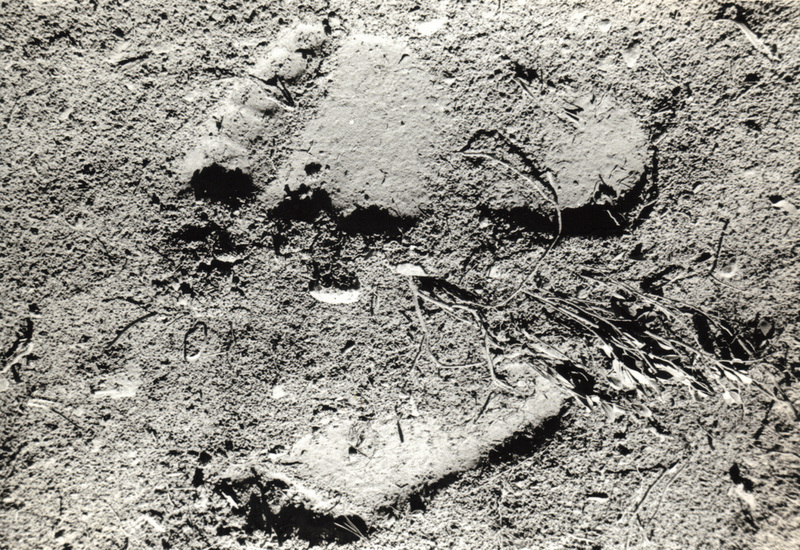 This photo taken, by René Dahinden, is considered one of the best ever taken of a sasquatch footprint. The 13-inch print was in deep dust, dampened on the the surface by a brief rain. 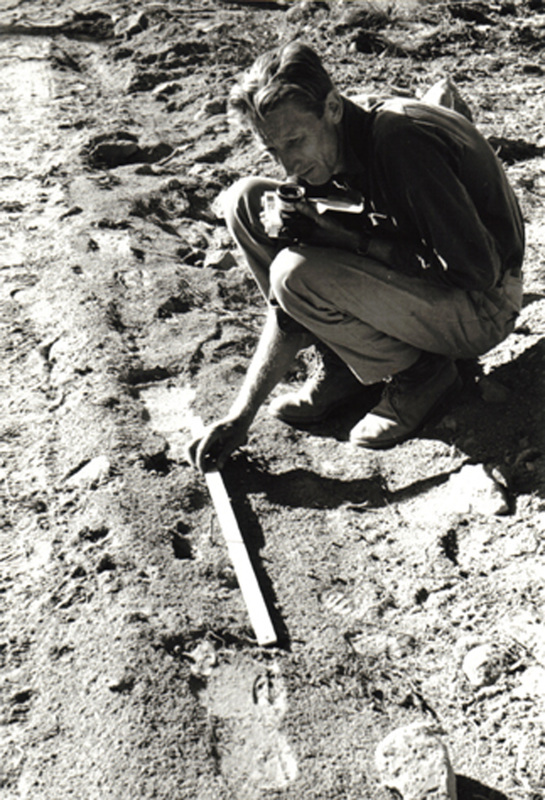 René Dahinden measuring the same prints as those seen being measured by John Green (previous photo). The color provides a better insight as to the type of soil. Photograph of a 13-inch print in color, although apparently faded after 45 years. A larger (15-inch) print and smaller (13-inch) print pointing in different directions. This photo and others appears to indicate the creatures ambled along the roadway. 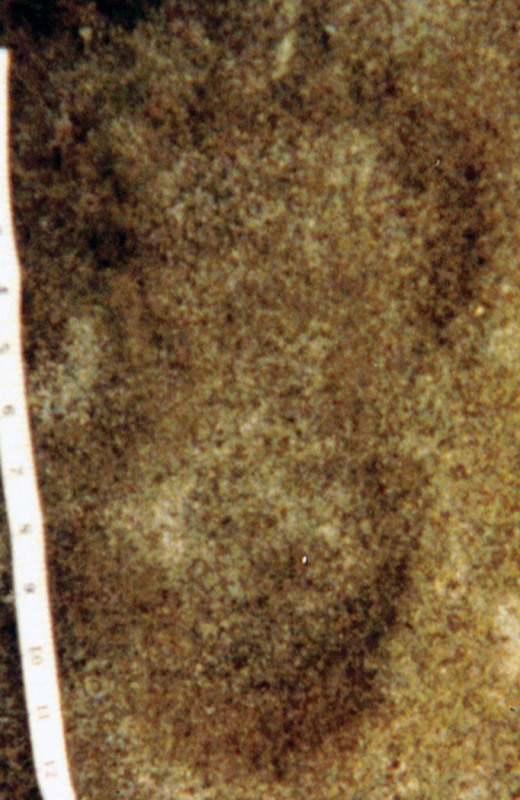 It can be very clearly seen here on a 13-inch print that the width of the toes was about 7 inches. 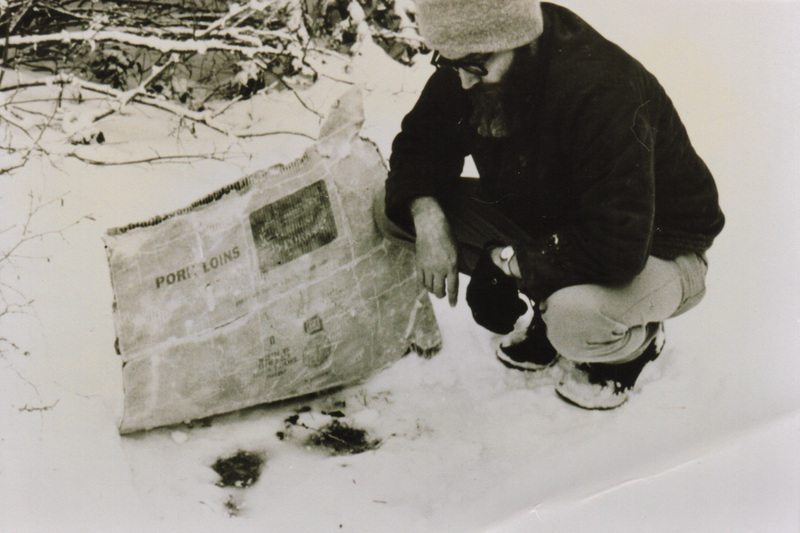 Don Abbott of British Columbia Provincial Museum (now Royal Museum) is seen here attempting to lift a glue-treated print out of the ground. Unfortunately, he was unable to remove it intact so it never made it back to British Columbia. Don Abbott spraying a print, probably for identification purposes. 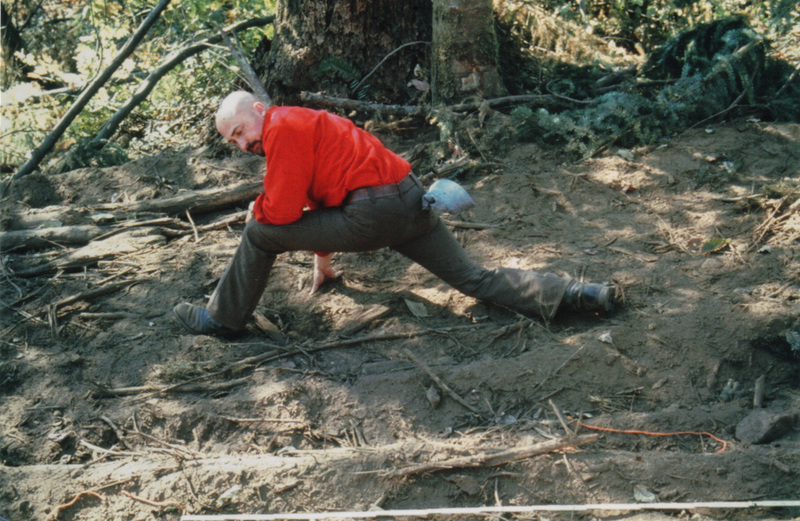 The photographs shown here were taken by John Green and René Dahinden during research they performed at Bossburg, Washington, in 1969. 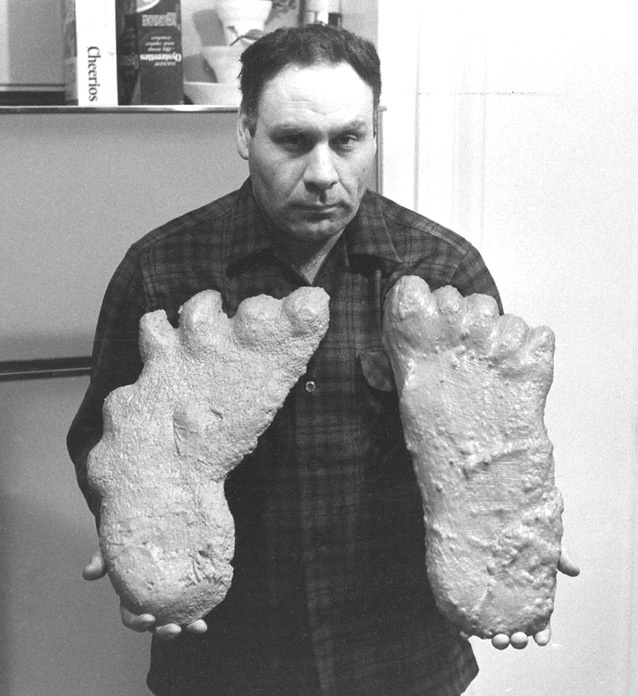 The unusual cripple-foot prints were found at two different locations near Bossburg in 1968 about two weeks apart. It is immediately seen that the right foot is deformed -- thus the name "cripple-foot." The probably scientific reason for the deformity is provided in the section "Dr. Meldrum and the Footprint Facts." Although the deformed foot appears to show just four toes, it is reasoned that one toe "pushed up" as a result of the deformity so did not touch the ground. 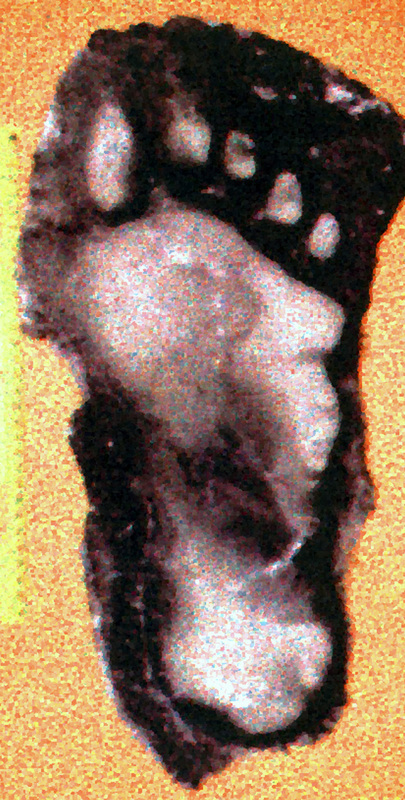 A very slight impression of the missing toe can be seen in the print made in snow (it is between the first and second toes from the right). 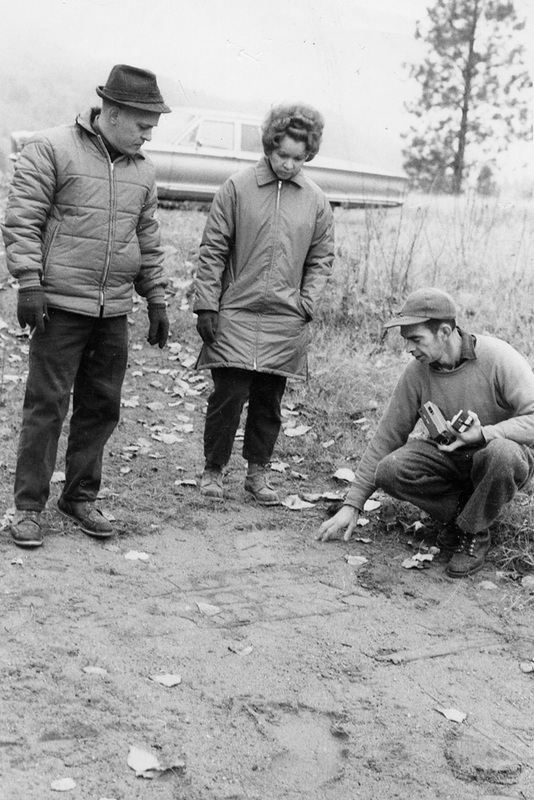 Norm Davis (left), his wife Carol (owners of a Colville, Washington, radio station) and Joe Rhodes inspect cripple-foot prints found near a Bossburg garbage dump in late 1969. These prints were the first to be found. 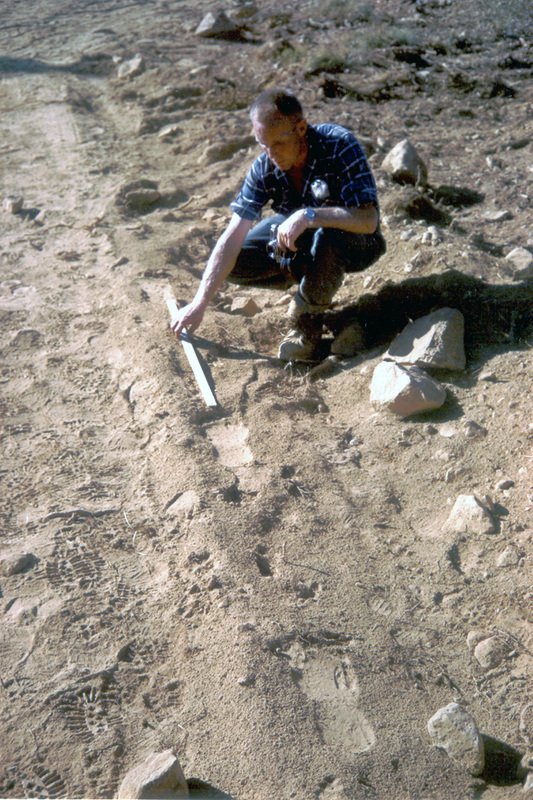 A single cripple-foot print in soil. It was used to make the first cast set. 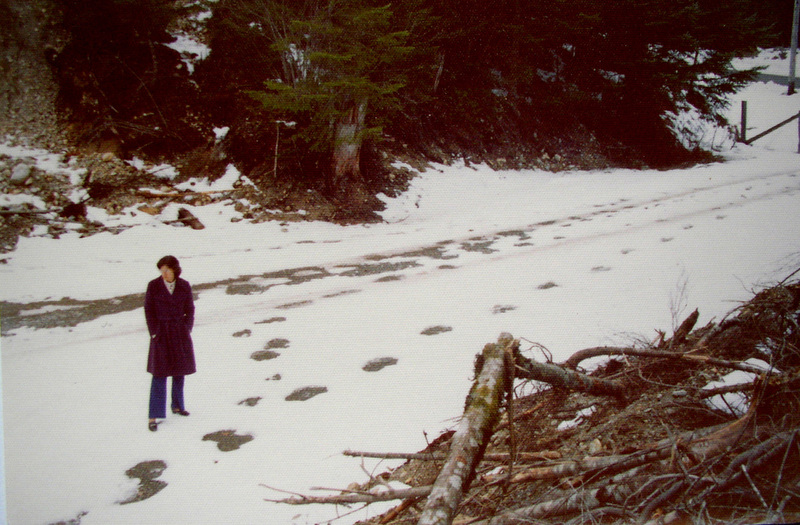 Dr. Grover Krantz examines one of the Bossburg, Washington, cripple- foot prints in snow, late December 1969 or early January 1970. Dr. Krantz was highly impressed with the casts made from the prints. He stated that the nature of the creature's deformed foot was such that if the prints were a fabrication then whoever made them had to have a superior knowledge of anatomy. Such knowledge, he reasoned, was far beyond that of nonprofessional people. 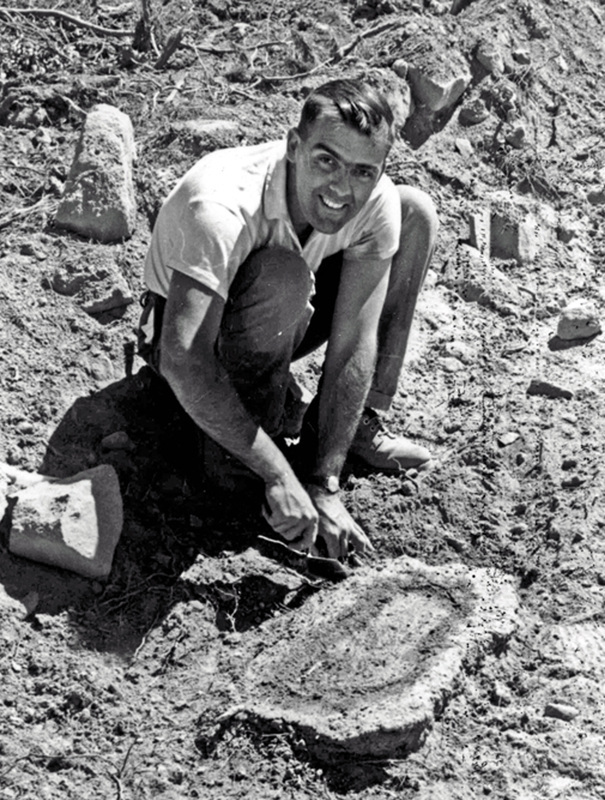 René Dahinden holding the second set of casts made from the cripple-foot prints. 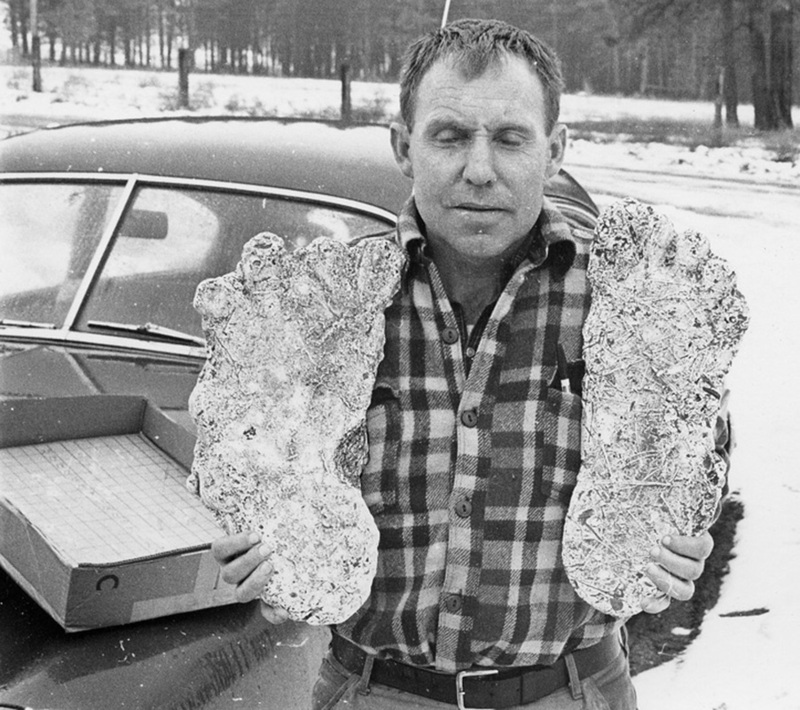 Border Patrolman, John Susemiehl, is holding the first set of casts made from the unusual prints. 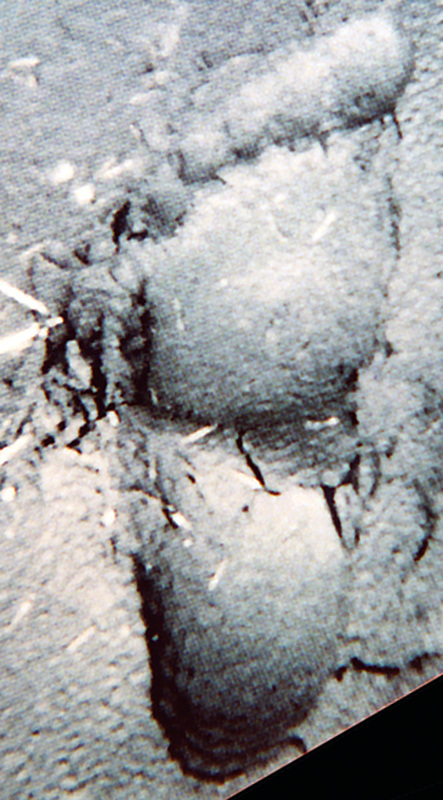 Close up of a single cripple-foot print in snow. Buncombe Hollow is a narrow, dead end road bordering the southern shores and the Merwin Dam Reservoir. Loggers on duty at a 24 hour watch on slash burning, sensed a 'presence' during the night and in the morning saw unusual footprints. 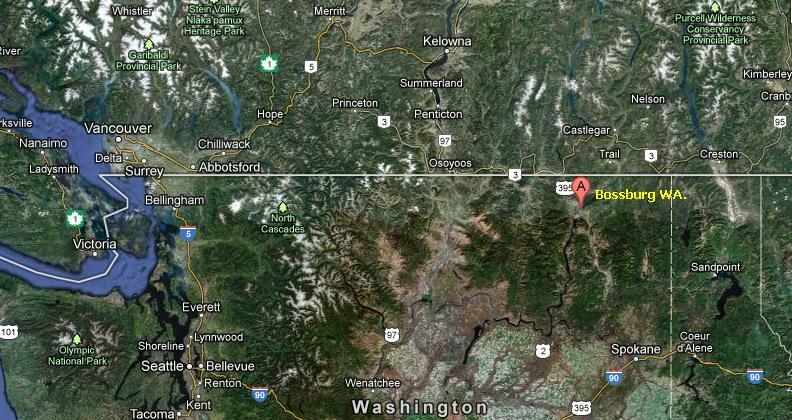 They notified Robert Morgan (a noted sasquatch researcher), and he and Eliza Moorman went immediately to the area. 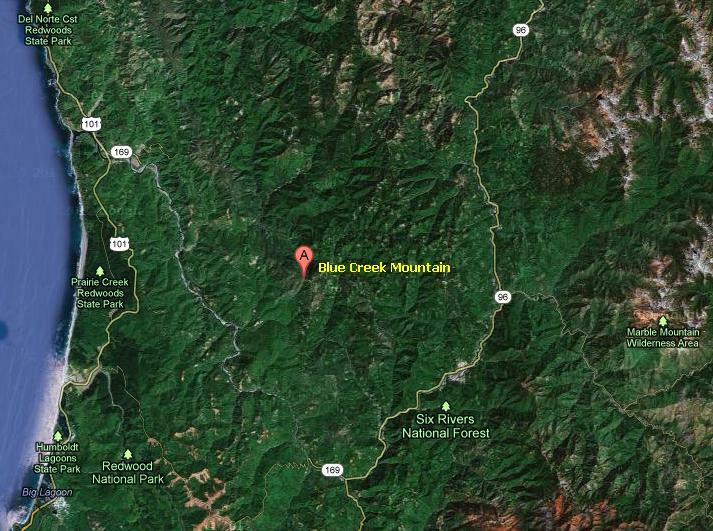 They followed the prints first uphill along the long drag and then down to where they entered Buncombe Creek. In all, an unbroken string of 161 prints were counted. 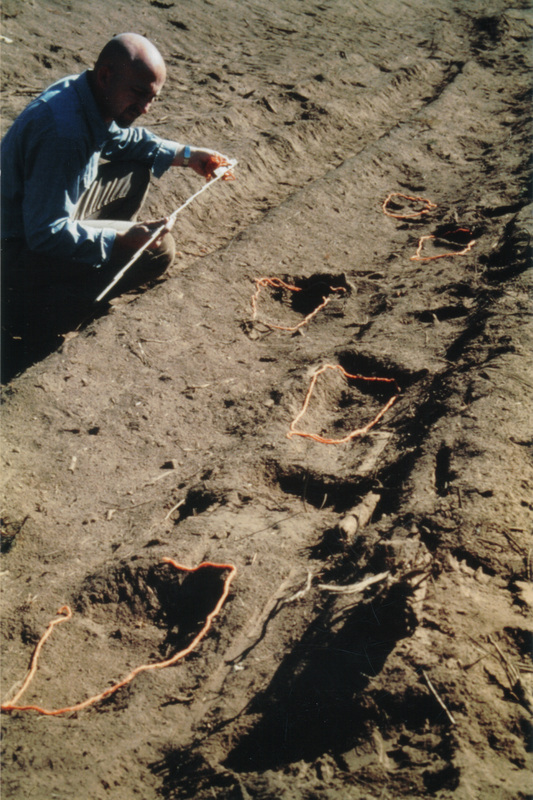 As the prints traversed several types of terrain, the effects of toe movements in different soil types and soil compaction could be compared. 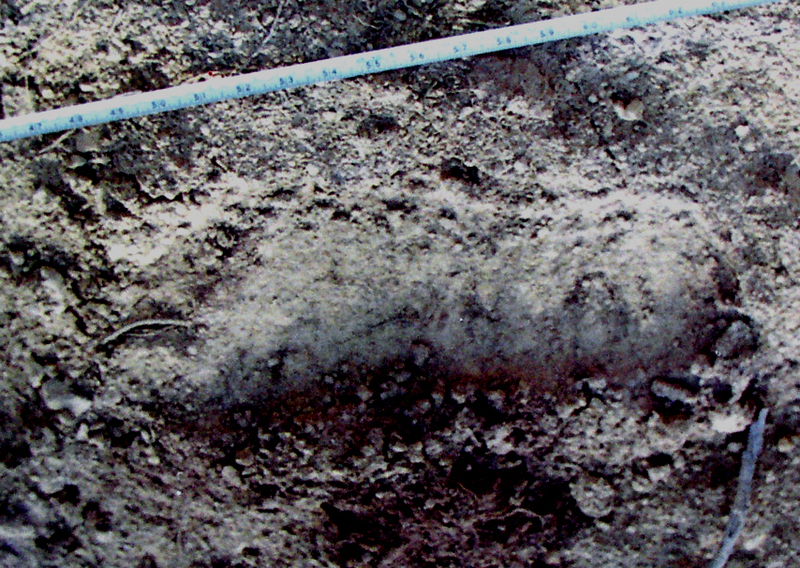 Morgan contacted Dr. Grover Krantz, who personally investigated the find. Close up of a Buncombe Hollow print. It measured about 17 inches long. Robert Morgan demonstrates the creature's pace. 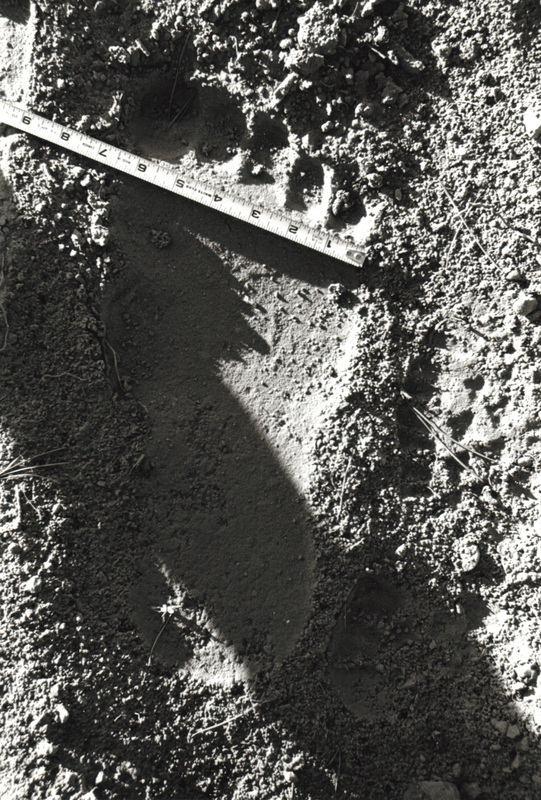 Soil compaction underneath a footprint is a product of impressed weight and speed of impact. These drawings are an interpretation of an experiment with shoes in loose dirt. 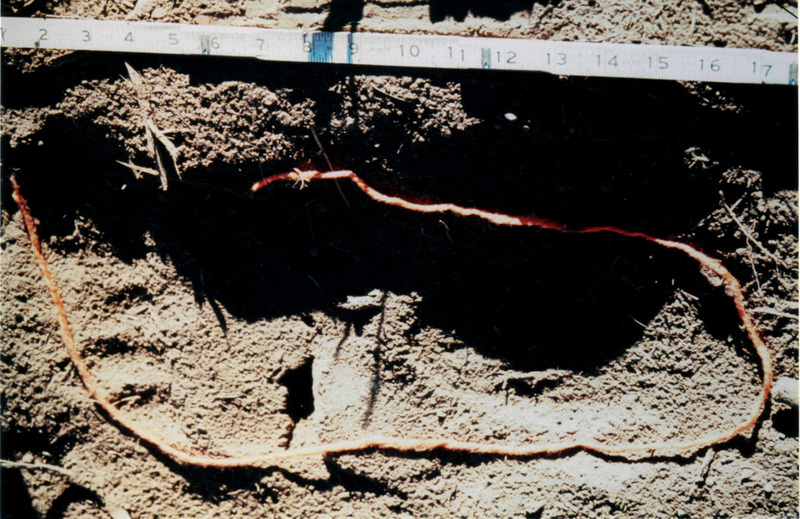 At walking speed (left), soil is compacted directly under the sole, while some is pushed aside and rises in the direction of least resistance. 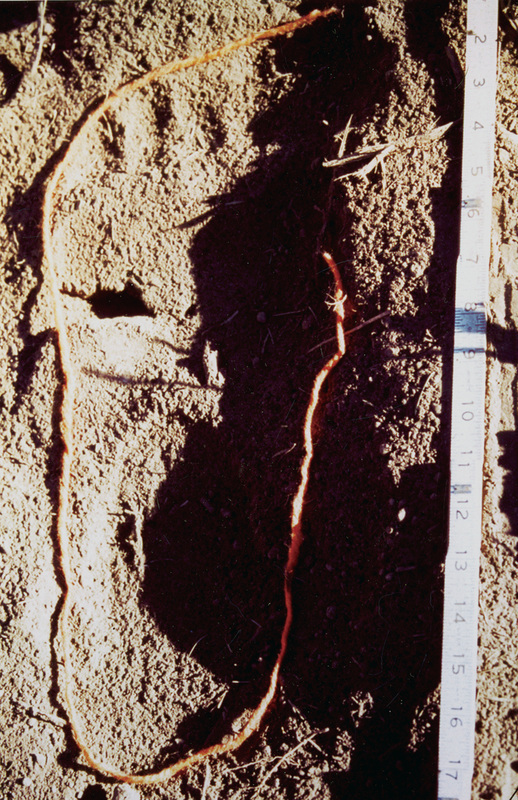 With more forceful stamping (right), soil compaction is somewhat greater, and the side-shifted dirt is moved more rapidly. 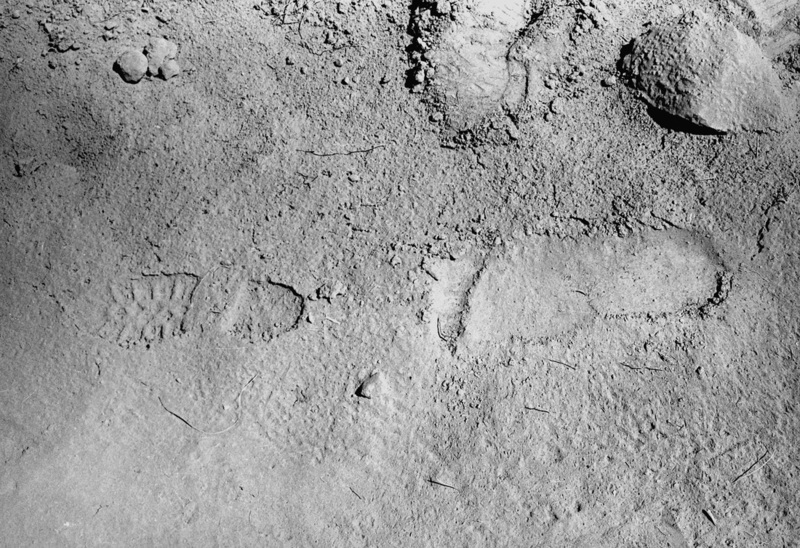 This rapid movement carries the dirt farther, leaving no mounding and a less distinct foot outline. 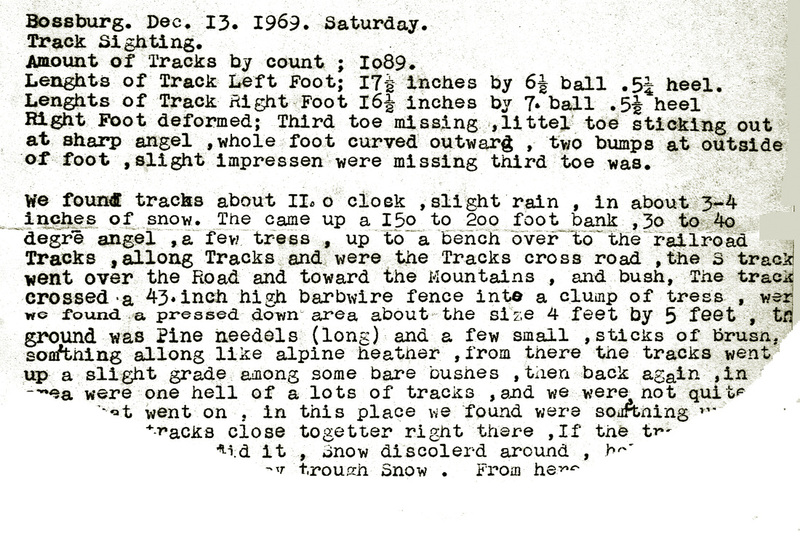 "While examining a set of tracks in southwestern Washington, the idea of impact faking occurred to me. 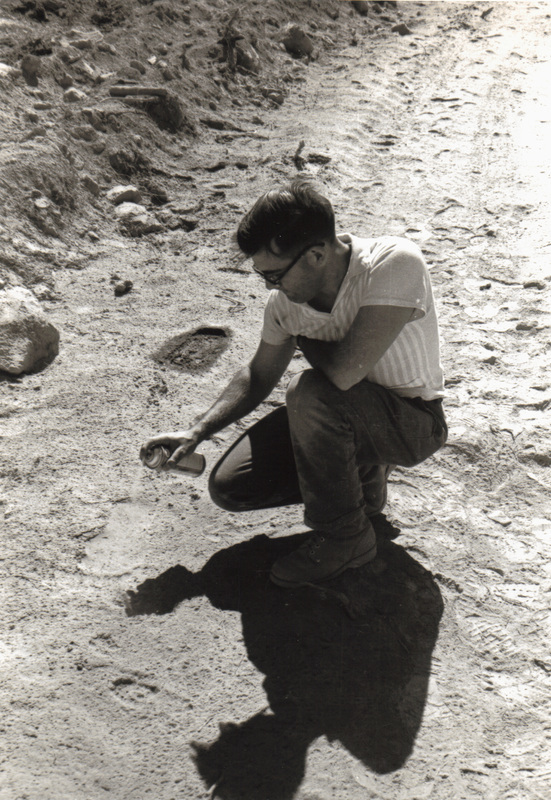 In this particular instance most of the footprints were in loose dirt and I had already noticed the pressure mound of dirt that surrounded many of the them. A simple experiment showed that when I walked by, a similar pressure mound was pushed up around my own prints. 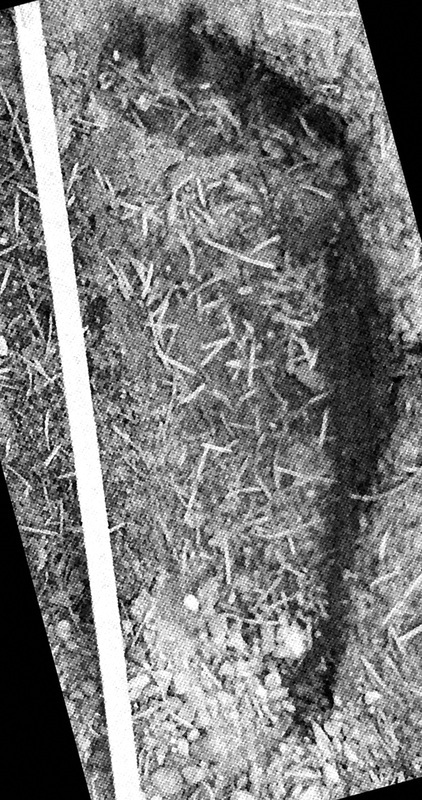 But when I stamped my foot with some force, the dirt was shifted aside with much more speed and no mound developed (Fig 16, shown on the left). 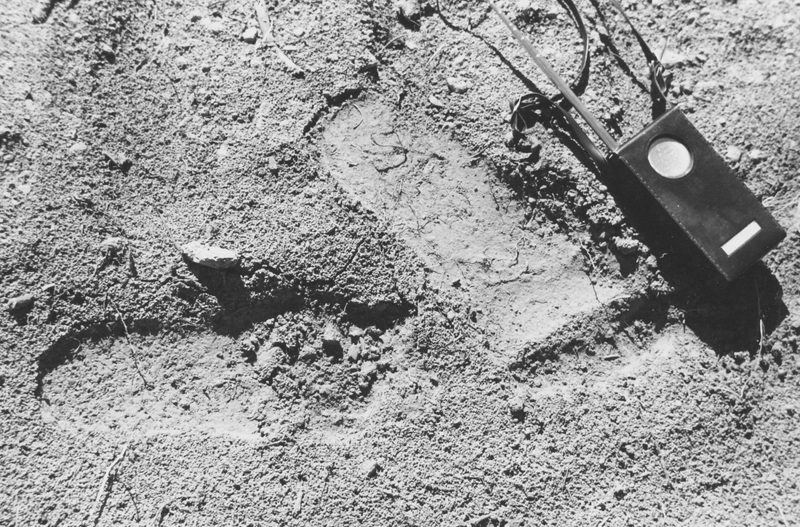 My conclusion was that something there had placed those footprints with upwards of 800 pounds of weight coming down on them with no more than a striding gait." In 1980, a sasquatch figure was adopted as the symbol of the Chehalis First Nations Band in British Columbia. 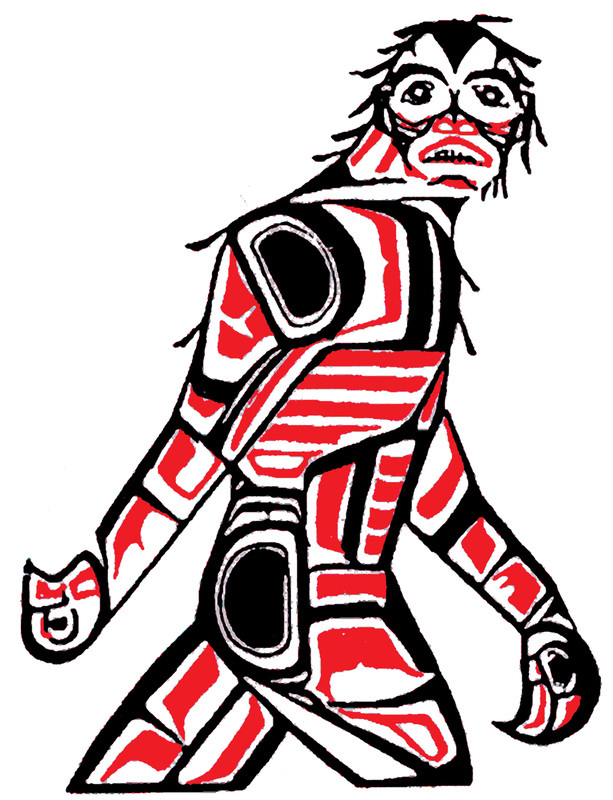 The Chehalis, BC, band has an extremely colorful history of the sasquatch in their culture. The band adopted a sasquatch logo, seen here, in 1980. 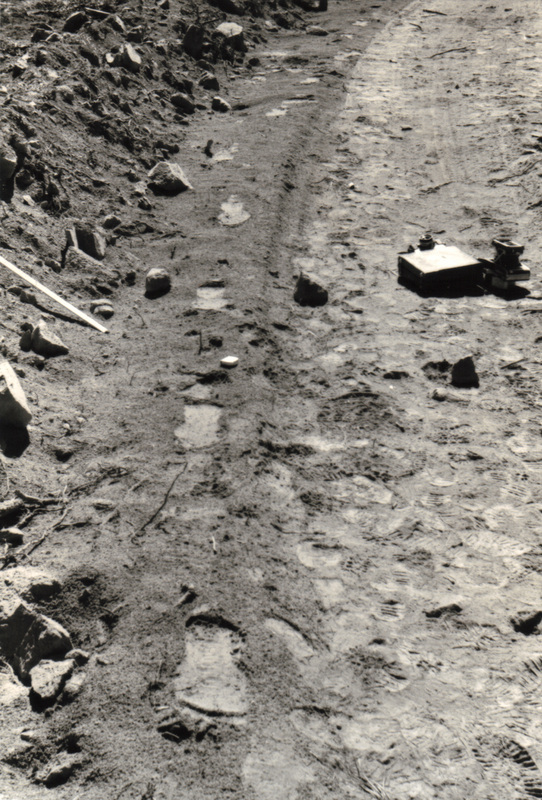 June Green, wife of eminent researcher John Green, is seen here observing unusual tracks at Chehalis in about 1960. 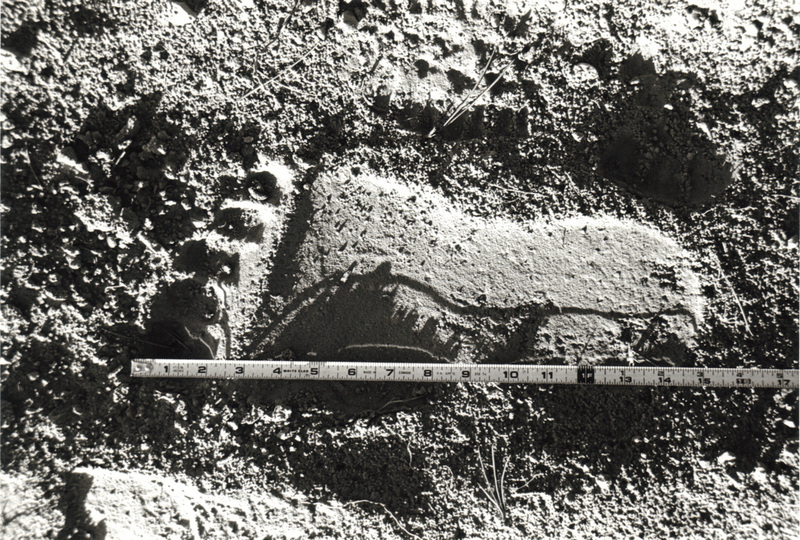 One of four 12-inch footprints found along the Chehalis River by Brad Tombe in 1995. 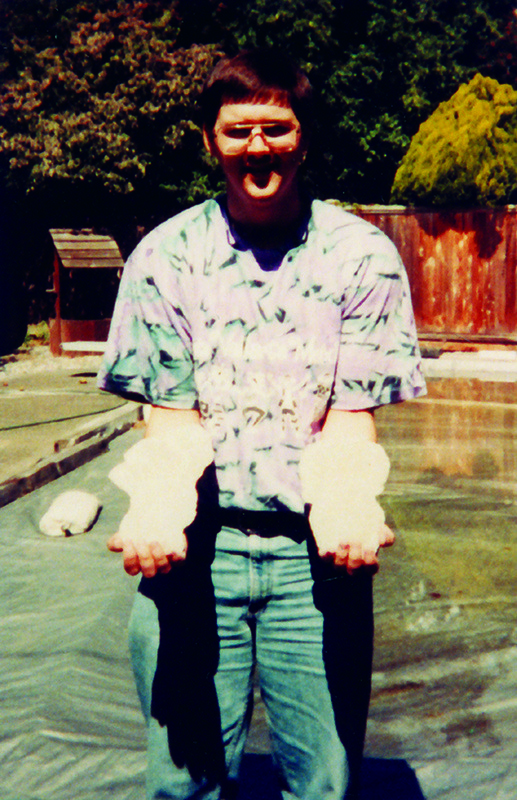 Brad is seen on the right holding casts he made of two prints. The find coincided with a recent sasquatch sighting. 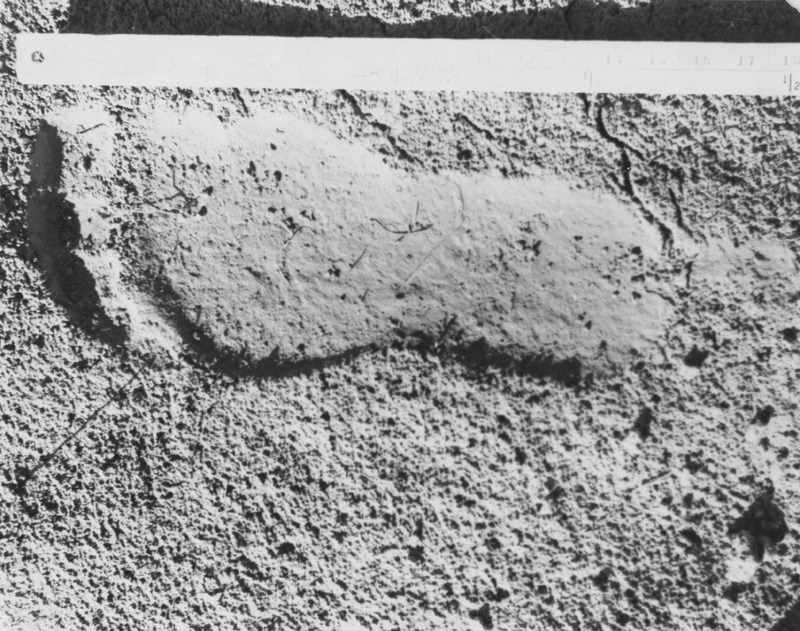 Provided here are photographs of footprints, in addition to those previously presents, found over the last 35 years in California, Washington, and British Columbia. There have been others, this is primarily just a reasonable sampling.